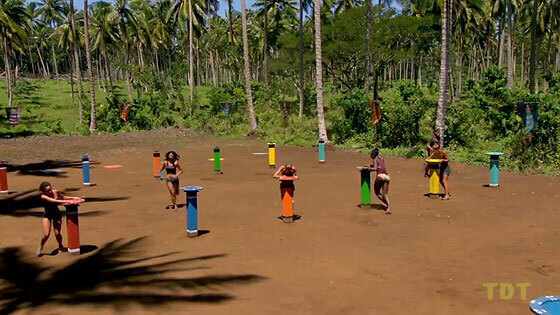 Pre-game Ep1: "Two Tribes, One Camp, No Rules" (Season premiere) Ep2: "Total Dysfunction" Ep3: "One World Is Out..."
Day 1: The contestants arrive on a truck, are divided into two tribes, men (Manono) vs. women (Salani), but will live on one beach. They then have one minute to gather all the survival items they need from the truck. 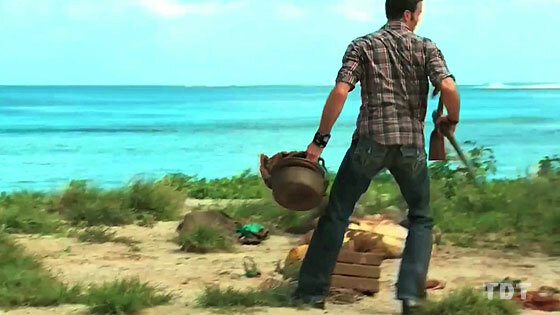 Michael steals a bunch of the women's stuff. 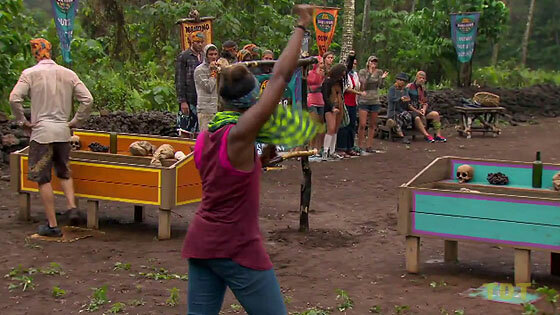 Sabrina finds idol, but it's for Manono (gives it to Colton). 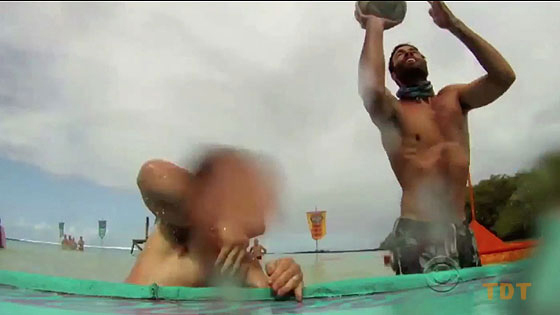 Manono wins immunity and flint when Kourtney breaks her wrist. Ep1 RC/IC: "Free Fallin'" - Manono wins. TC1 - Kourtney out, 17 left. 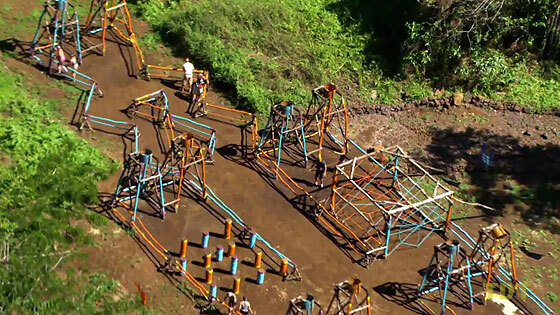 Ropes, knots, future Leif beds, and blurring aplenty... but no Probst. Manono wins a tarp. Ep2 RC: "DIY Knots" - Manono wins. Vanuatu redux, except this time it's all dude-power that reigns. Manono wins yet again. Ep2 IC: "By The Numbers" - Manono wins. Salani finally wins, shutting out the men of Manono, 5-0, in a memory challenge. Salani gets fishing gear and a canoe. Ep3 RC: "Shut Your Trap" - Salani wins. Ep3: "One World Is Out the Window" Ep4: "Bum-Puzzled" Ep5: "A Bunch of Idiots"
Massive blindfolded obstacle course, followed by puzzles. Salani wins. Ep3 IC: "Ow Pairs" - Salani wins. TC3 - Matt voted out (7-1-1), 15 left. 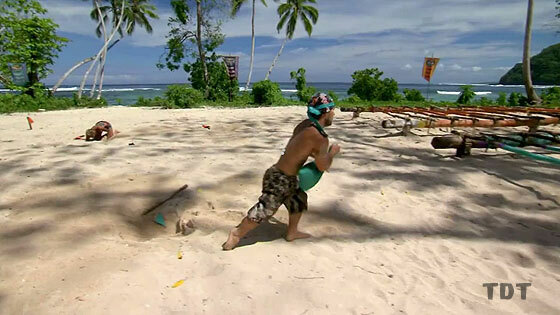 Salani proves superior at slingshot-ing coconuts into a grid. They choose a tarp. 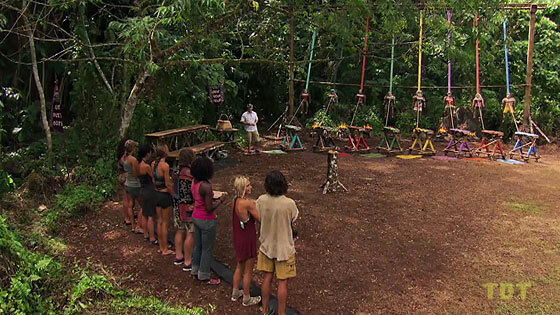 Manono wins easily, but then promptly decides to go to tribal council anyway. 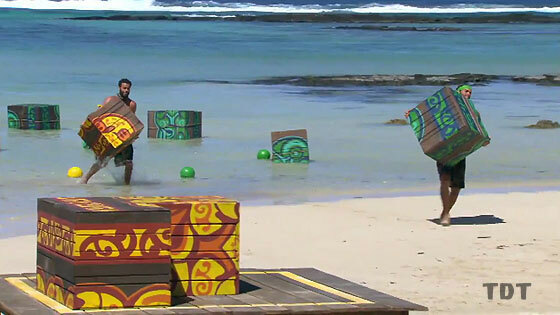 Ep4 IC: "Puzzle Relay" - Manono wins (then abdicates). New Salani better carries leaky buckets, wins PB and J, possession of the One World camp. Ep5: "A Bunch of Idiots" Ep6: "Thanks For the Souvenir" Ep7: "The Beauty in a Merge"
Michael shoves everyone else aside, new Salani wins easily. Ep5 IC: "Basket-brawl" - Salani wins. Salani owns Manono at trampolining coconuts into pots, wins ice cream. Colton is removed from the game after being diagnosed with possible appendicitis, takes Hidden Idol with him. 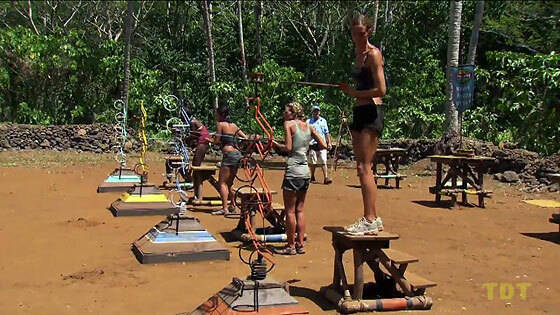 Troyzan, Christina, Jay, Alicia, Sabrina, Chelsea win pizza and beer. 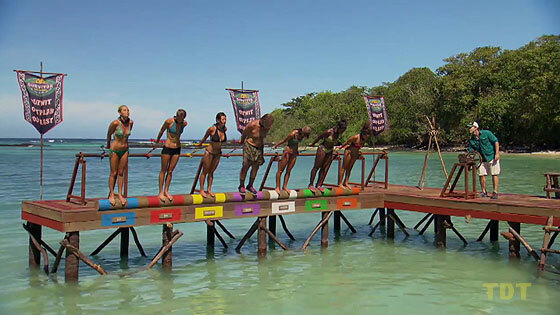 Ep7 RC: "Sea Turtles" - Troyzan, Christina, Jay, Alicia, Sabrina, Chelsea win. Troyzan proves the best at not moving his balls in a while. 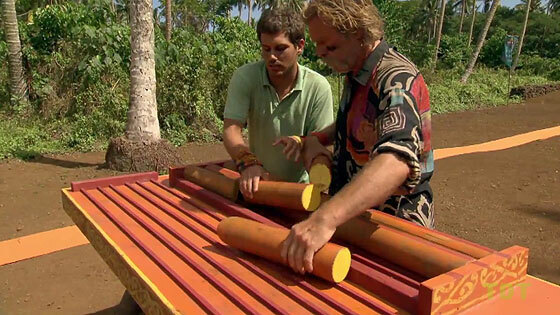 Ep7 IC: "Roller Ball" - Troyzan wins. TC7 - Jonas voted out (10-2), 11 left. Ep8: "Just Annihilate Them" Ep9: "Go Out With A Bang" Ep10: "I'm No Dummy"
Kim, Leif, Mike, Christina and Sabrina win barbecue, plus lots of 7UP. 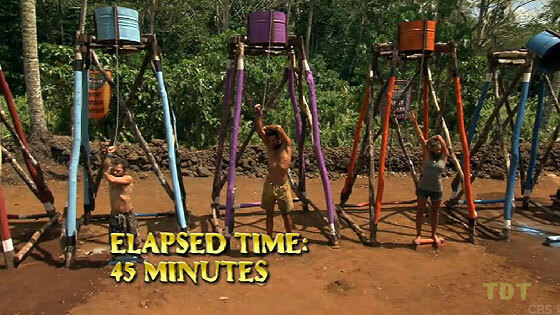 Ep8 RC: "7UP" - Kim, Leif, Mike, Christina, Sabrina win. After a two-stage challenge, Jay comes back to win the final puzzle. Ep8 IC: "Odd Shaped Bottoms" - Jay wins. TC8 - Michael voted out (7-2-2), 10 left. 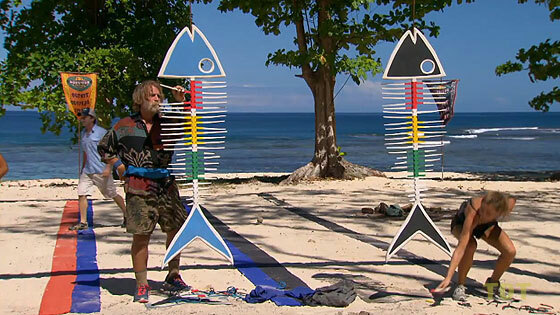 In another lame (albeit Probst-free) successor to bocce, Troyzan, Jay, Tarzan, Alicia and Kat win a fish barbecue for tossing bolos onto sticks. Ep9 IC: "When It Rains, It Pours" - Chelsea wins. Kim gets a shower, gets naked for peanut butter and chocolate. 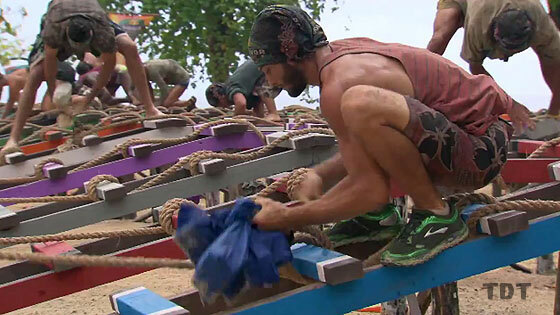 Troyzan gets an IC advantage. Christina gets yelled at. 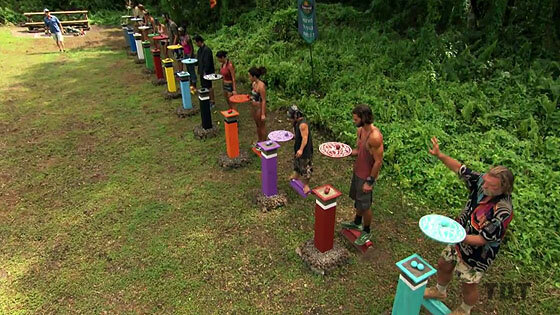 Ep10 RC: "Survivor Auction" - Troyzan buys IC advantage. 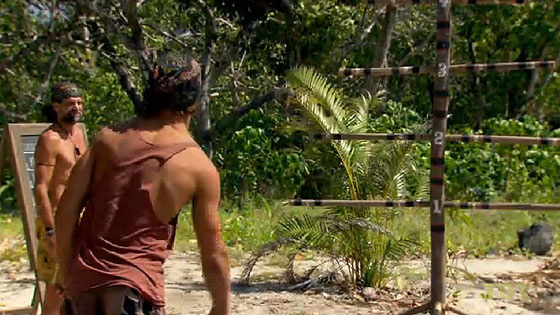 Ep10 IC: "Return from the Dead" - Troyzan wins. TC10 - Leif voted out (4-3-2), 8 left. Ep11: "Never Say Die" Ep12: "It's Gonna Be Chaos" Ep13: "It's Human Nature"
Kim survives the chop-your-friends challenge, takes Alicia and Chelsea for a helicopter picnic. Kim wins again, beating Chelsea in the final face-off of sliding-then-ring-toss. Ep11 IC: "Slip Sliding Away" - Kim wins. Kat and her cousin make it through non-quantum entanglement. Kat chooses Kim & Alicia & their loved ones for wings & margaritas. 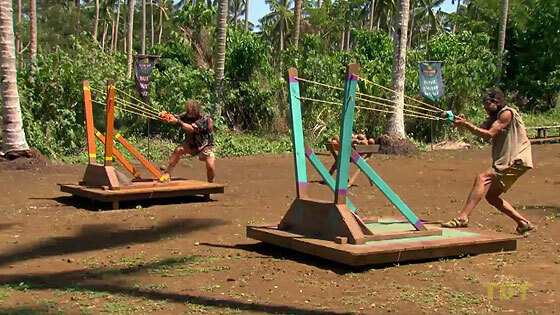 Some old lady named Kim wins again, beating Kat at outlasting Probst's torture device. Ep12 IC: "I Hold On" - Kim wins. TC12 - Kat voted out (6-1), 6 left. Chelsea spins around three wheels and solves a combination lock. She chooses Sabrina & Kim to join her on an overnight yacht trip. Ep13 RC: "Spinning Wheel" - Chelsea wins, takes Sabrina & Kim. 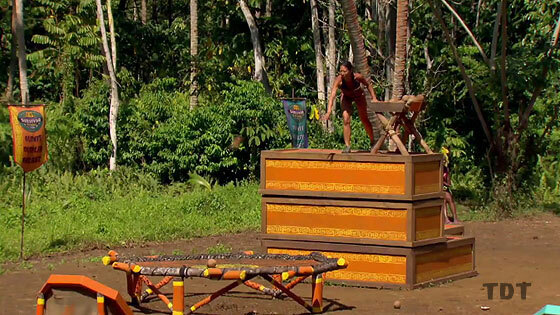 A challenge so easy, even Alicia can win. 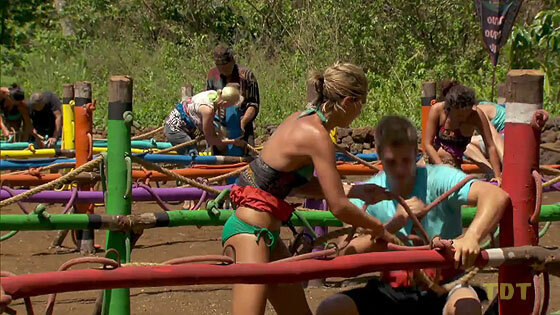 Ep13 IC: "Bone to Pick" - Alicia wins. A maze, a puzzle, a combination lock: A Kim win. Ep14 F5 IC: "Balance Beam Maze" - Kim wins. Kim proves better at stacking tiny tables. Ep14 F4 IC: "Operation Balance Build" - Kim wins.